A pair of feet hung out a car window on Beacon Street in Cleveland Circle on Tuesday. Temperatures in the 90s and high humidity combined Tuesday to make it feel like it was more than 100 degrees in many parts of the state. The National Weather Service issued an excessive heat warning that will remain in effect until 9 p.m. Wednesday. 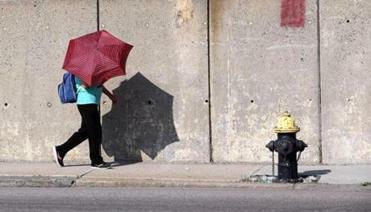 At 4 p.m., the temperature was 96 degrees in Boston. With a dewpoint of 70, it felt like it was 102 degrees. Dave Epstein: When will this heat end? There is virtually no chance of precipitation until Thursday when a cold front moves into the area. The sweltering conditions will continue into Wednesday, which will be sunny and hot, with highs in the upper 90s. Wednesday night will also be warm and muggy, with lows only dipping into the mid-70s, forecasters said. Thursday’s high temperatures are expected to be in the 80s. Then we should get some relief from the heat as cooler weather is expected for Friday and the weekend. Forecasters said the chances for showers or a thunderstorm increase Thursday as a cold front moves through the area. Friday and Saturday should be noticeably cooler and less humid, with highs in the 70s. Martin Finucane of the Globe staff contributed to this report. Emily Sweeney can be reached at esweeney@globe.com. Follow her on Twitter @emilysweeney.